This oval brooch from Ospisdale, near Dornoch, is probably all that remains of a female Viking grave. It is a type of brooch commonly worn in a pair by Scandinavian women to hold up their tunics, sometimes with a string of beads hung between them. In some cases useful personal objects such as a small knife, whetstone, or needle case were suspended from one brooch. These brooches were formerly called tortoise brooches, due to the shape and textured surface. They are of complex construction, having an undershell, and then an openwork shell on top, often decorated with interlaced animals and masks. On the Ospisdale brooch, the outer, openwork shell was decorated with twisted silver wire and raised knobs, some of which are missing now. It has been flattened on one side, destroying part of the outer shell. Like most oval brooches, the Ospisdale brooch is of copper alloy, in this case brass. Sometimes the brooches are also gilt. Many seem to have been mass produced in Norway, and traded or taken where Vikings travelled. 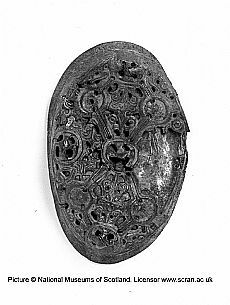 Oval brooches have been found from Russia to Iceland, and including Ireland, Scotland and England. In Scotland a number have been found in Orkney, Shetland, the Western Isles and the northern mainland. Most are found in female graves accompanied by other gravegoods, and are therefore an indication of pagan beliefs. They generally date to the 9th and 10th centuries. Occasionally oval brooches preserve evidence of textiles on the back, as is the case here. The Ospisdale brooch is the furthest south of any such brooch in the Highland mainland. Nearby at Dunrobin Castle the undershells of two similar brooches were found, also probably from an unrecorded Viking burial. Together they represent evidence of Viking settlement in the area. The brooch is currently on display at Dornoch HistoryLinks Museum, on loan from the National Museums of Scotland . Anna Ritchie 1993. Viking Scotland (B.T. Batsford Ltd/Historic Scotland). James Graham-Campbell and Colleen Batey 1998. Vikings in Scotland: An Archaeological Survey (Edinburgh University Press).